"Pacific sea salt is cool smoked for 48 hours over red alderwood to give a hearty smoked flavor for any dish either on or off the BBQ." When they say "smoked for 48 hours", that is no joke! The smoky smell of this stuff is so strong that I could smell it through multiple layers of packaging straight out of the mailbox, and I only bought about 1/4 cup. Once I received it, and realized how strong it is, I was honestly at a loss for ideas of how I might use it. Recently, the knowledge that my beloved Copper River Salmon would be hitting the stores soon provided the needed inspiration. 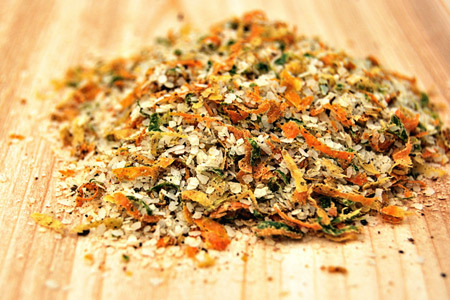 The thought was to use a small amount to make a smoky citrus seasoning that I hoped would be great on fish. Here is what I came up with. Combine all the ingredients in a small zip-top bag and shake to combine. Set aside for at least three hours to allow the flavors to marry. Use as you would any other seasoning. A Microplane is indispensable for easy zesting. I ground the pepper and smoked salt together in an electric coffee grinder that I have set aside specifically for spice grinding. I had a serious hankerin' for steak this weekend. While I was at the store, I spied some nice looking flat iron steaks. For those unfamiliar, these are also sometimes called "Shoulder Top Blade Steak", or simply "Top Blade Steak". 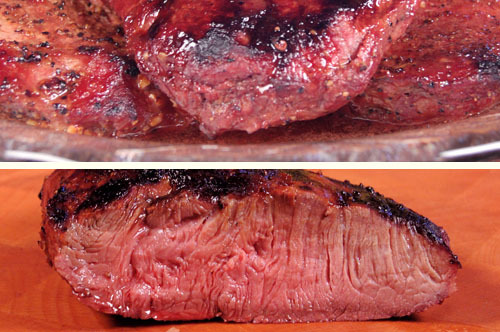 It's cut from the chuck primal and it resembles a narrow flank steak. Don't let the "chuck" part turn you away, as the flat iron is a seriously good cut that is often overlooked. I'll take one of these over a top sirloin any day! I decided to pick up three as close in weight as possible. I wanted them to cook evenly without a bunch of tending. I then thought that I'd conduct a little experiment with my ladies and prepare them three different ways. Steak 1 - Marinated in Patio Daddio Bovine Bath. Steak 2 - A moderate dose of Kosher salt and McCormick Worcestershire pepper. Steak 3 - A heavy dose of McCormick Grill Mates® Montreal Steak Seasoning. Each steak was marinated in a zip-top bag for three hours. I then cooked them identically to medium over a rocket-hot blend of Kingsford Charwood and Best of the West Mesquite Lump Charcoal. After the taste testing, the ladies ended in a tie between steak two and steak three. I was the tie-breaker when I voted for steak three. The bottom line is that I think I will start using a blend of kosher salt, black pepper and a dash of Montreal steak seasoning. I think the ladies were a little surprised at how various seasonings can affect the same cut of meat. It was fun, and I learned how they like their steak. Try it and see what your family likes. I spent most of the early years of my life in the northeast (Ashtabula, Ohio for you geographic types). Some call the greater Cleveland area "The Mistake on the Lake", but I'll just let that ride, as you never know when your Mother or Grandmother might be reading. Suffice it to say that this young man moved west. I know you're probably sitting there thinking, "Great. I hate to break up the family reunion, but what does any of this have to do with barbecued baloney?" Well, when I was a young lad my hero was my Grandfather. We grandkids spent most of our Saturday afternoons with him in those years. Occasionally, he would make fried baloney sandwiches for lunch. 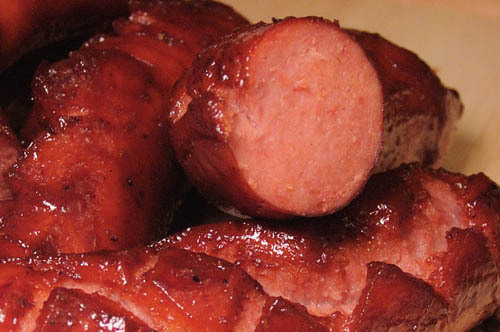 When I first tried barbecued baloney I couldn't help but think of my dear Grandfather. I just knew it was something that he would have loved. OK, I'm getting misty-eyed, so let's get on with the recipe. This recipe falls solidly in the &apos;brain-dead easy&apos; category. If you struggle with this, you should seriously consider hanging up your tongs. Please note the lack of an H in that last word. I won't even go there. As always, click the image to see the larger version. Start your fire and prepare for indirect cooking at medium heat (about 225º). Score one side of the baloney in a crosshatch pattern (see the picture above) about 1/8" deep. 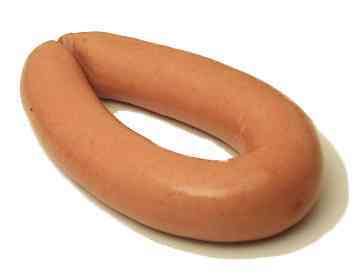 Smear the entire ring of baloney with the mustard. Dust all sides of the baloney with the seasoning. Cook the baloney indirect for about 90 minutes, without turning. Brush the entire ring with the BBQ sauce and cook another 15 minutes. Remove the ring to a platter. Coat the ring with the remaining BBQ sauce and let rest 10 minutes. Cut the ring into 1/2" slices, serve and enjoy. We had a salsa contest at work for Cinco de Mayo, and this was my entry. 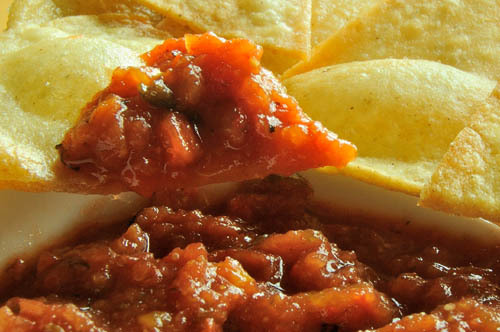 The &apos;diablo&apos; in the name is Spanish for &apos;devil&apos;, so you might think this is a salsa that is so hot that it will give your mouth second-degree burns. In reality, it's fairly mild and subtly smoky, with just a hint of heat. I chose the name because all of the major ingredients are fire-roasted. Come on, what else would you expect from a BBQ guy? If you've never roasted peppers, I highly recommend this video. I roasted mine on the grill over mesquite lump charcoal, but indoor roasting will certainly work. Note: If you like your salsa hot, simply double the jalepenos, or substitute a hotter pepper like a serrano. If you are a true chile head, or like practical jokes, you could even use habanero. Roast the peppers (and also the green onions, if you're using your grill). Peel, seed and dice the peppers. Chop the green onions small. Mix all of the ingredients well in a large mixing bowl. Blend with a stick blender to your desired consistency. Note: If you don't have a stick blender, process it in batches in your food processor or blender. Cover and refrigerate at least four hours, or preferably overnight. Taste and adjust the seasoning before serving. You may need to add a little salt. The Prilosec OTC® BBQ Shootout Series is a KCBS-sanctioned series of head-to-head competitions at various NASCAR® raceways across the country. Each competitor was invited to participate. 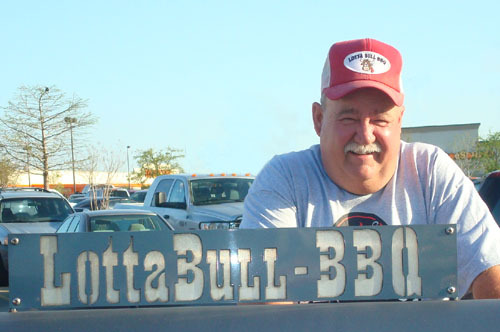 Given their tremendous success on the KCBS circuit, Mike and Debbie Davis of Lotta Bull BBQ are one of the teams competing. In addition to the competitions, some of the teams appear at a local participating Wal-Mart store the Wednesday or Thursday before each event to meet the fans, conduct cooking demonstrations and sign autographs. Mike and Debbie have been a great inspiration to me as a new competition cook, so I was thrilled to be given the opportunity to ask Mike a few questions about the series. He and Debbie are very busy people, so I greatly appreciate his taking the time to give us his thoughts. Me: You're obviously a very, very seasoned KCBS cook. 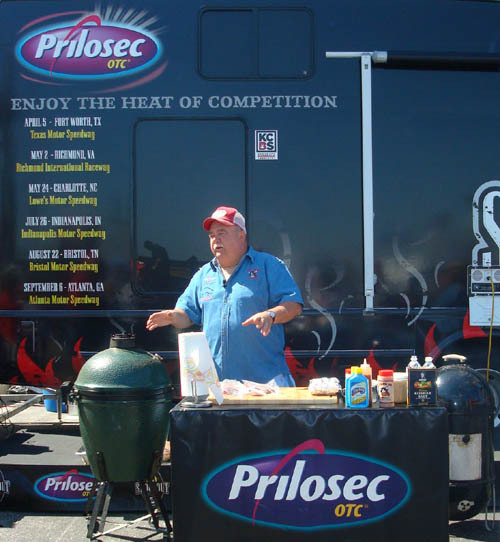 How does cooking at a Prilosec OTC BBQ Shootout event differ from a standard KCBS competition? Mike: As far as the Prilosec OTC event versus a standard KCBS cookoff, it really doesn't. It's just another day at the office. Me: Are you cooking during a race? If so, what do the noise and crowd do to your competition mindset? Mike: There's a race going on? (laughs) You just have to focus on the task at hand, and try to tune out the noise, but you can't tune out the crowd. I mean, you have to, to an extent, but some of those folks came to see you, and some follow your career better than you do, so you have to make time for them. Me: The travel for the Shootout series must be pretty hectic. How many of these events will you participate in? Mike: The Series is pretty easy, it's when we throw in all the other things we've got going on into the pot that it gets hectic, but we are hoping to do all 6 events. Me: There have been a lot of comparisons of competition barbecue to the early days of NASCAR. Do you see that as a valid comparison? Mike: Kind of. It was all started as a grass roots good 'ol boy type of thing, just good folks having a good time, only we ain't running 'shine. But then, maybe that is where they were running it to... a BBQ! Me: Can you envision competition BBQ becoming as popular as NASCAR one day? Mike: I would like to think that it would, but we're gonna have to make it more interesting for the fans. If you know some of the cooks, it is okay, but just for the average Joe it's... Well, quite honestly, it's like watching grass grow sometimes. But then I think this where the folks like the ones at Prilosec OTC come in to play. They are from outside our normal circle. They bring things to the table that we wouldn't normally think about. That's why I am so excited to be a part of the Prilosec OTC BBQ Shootout Series and see what it will bring. Me: Do you have any tips can you offer up-and-coming competitive cooks? Mike: RUN... AND FAST! (laughs) But really, lots and lots of practice, and then do it again. 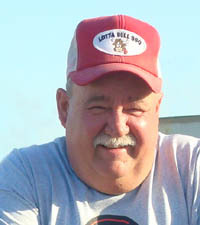 Do some research and take a class from one of the pitmasters that offer them. You'll save your self tons of aggravation and money while shortening the learning curve tremendously. But most importantly, remember there is a greater plan for us all, and to keep your priorities in order. Thanks again for your insight, Mike. I also want to thank Amanda Walsh of MS&L Worldwide for her offer and help in coordinating this. She was a joy to work with.